My dad was full of advice. If you knew him, you are smiling right now because you know how much advice he gave you. And sometimes it was really good advice, though I rarely admitted that, especially not in front of him. One of his best pieces of advice was to never start a bike ride in the rain. You’ll end plenty of them in it, he said, so why start out like that? I thought of that advice as I hopped on my bike on an early Thursday morning. It was raining, and there I was, starting a ride in the rain. If I could talk to him I’d suggest he amend that advice–never start a bike ride in the rain, unless following that advice would mean having to take the bus in Baltimore. Truth be told, if he were still with us, I probably wouldn’t make that call. We’d joke about it the next time we talked, which might have been awhile. 3+ months on, and I still don’t wish I could get that “one last call.” I want him there, living his life, me checking in on occasion, him still looking for chances to give me advice. My ride home was dry, and I stopped at North Avenue to snap this picture of the sky. I’d tell him that if you don’t start a ride in the rain sometimes, then you don’t get to finish in the post-storm air with this sort of sky above you. Totally worth it. And then just as I took this picture the skies opened up again, and I finished that last mile or so in rain. It is what it is. I made it home, dried myself off, and settled in for a lazy night at home, very glad I ignored his advice and went ahead and rode in the rain. 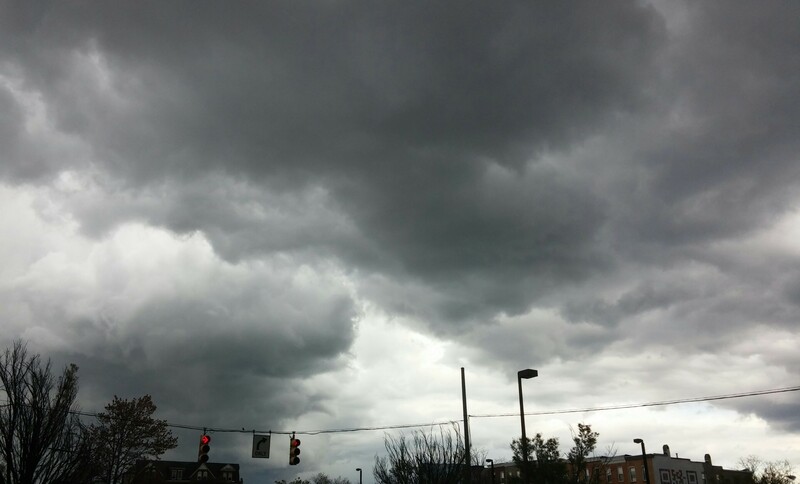 This entry was posted in personal, weather and tagged Baltimore, mourning, rain. Bookmark the permalink.